A planetary placement/combination in a native's horoscope that is not in sync with the cosmic alignment, is considered as a Dosh. A dosh formed in the horoscope of a native can lead to multiple serious problems, mainly related to the financial, marital and health aspects of his/her life. There are many different doshas that are formed due to the ill placement and ill conjunction of different planets in the horoscope, but, one Dosh that is most feared in astrology is: "Kaal Sarp Dosh". 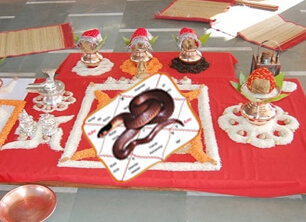 Kaal Sarp Dosh is formed when all 7 out of the nine planets in astrology are placed within 180 degrees of Rahu & Ketu. We are talking about "Goddess Kaal Sarp Dosh". In Kaal Sarp Dosh, Rahu (North Node of the Moon) and Ketu (South Node of the Moon), capture the remaining 7 planets within the 180 degrees grid that these two 'Shadow Planets' always form. This captivity of the 7 planets by Rahu (also known as Dragon's Head) and Ketu (also known as Dragon's Tail) is considered highly negative for a native. Kaal Sarp Dosh if not treated timely and properly, can bring irreversible bad luck in the life of a native and make his/her life, a living hell! So, is there a solution to get rid of the ill effects of Kaal Sarp Dosh? Yes, Kaal Sarp Dosh Puja is the solution to overcome the malefic outcomes of this dreaded dosh. Maa Kaal Sarp Dosh is a ruthless vanquisher of all the enemies of Her devotees. If a person manages to please Maa Kaal Sarp Dosh, even the greatest of enemies are defeated. Therefore, we urge you to book a Kaal Sarp Dosh Puja and make your life free from the harmful effects of Kaal Sarp Dosh, which otherwise can prove to be highly detrimental for your success & growth in life. Kaal Sarp Dosh Puja removes the highly negative effects of Kaal Sarp Dosh from an individual's life. Kaal Sarp Dosh Puja pacifies Rahu & Ketu which are considered as 'Naturally Malefic Planets' in astrology. Kaal Sarp Dosh Puja removes all obstacles & hurdles that the native has been facing due to Kaal Sarp Dosh in his/her life. Kaal Sarp Dosh Puja reverses the bad luck factor and introduces good luck and fortune in the life of the native. After getting the Kaal Sarp Dosh treated, one can witness a sudden spurt in the career aspect of his/her life. Kaal Sarp Dosh Puja blesses the individual with with a balanced and peaceful state of mind. Kaal Sarp Dosh Puja brings a clarity in terms of thinking and helps the native identify right opportunities at the right time in life. Kaal Sarp Dosh Puja, frees the benefic planets in the horoscope from the clutches of Rahu & Ketu and bring forth the positive effects of such planets. Kaal Sarp Dosh Puja blesses the native with a significant recovery from all ongoing ailments and bestows a sound health on the native. Kaal Sarp Dosh Puja blesses the individual with victory in legal battles and end of all disputes going on with respect to property. It must also be noted that Kaal Sarp Dosh Puja favours beneficial foreign travels as well. Kaal Sarp Dosh Puja protects a business from regulatory hurdles and brings abundance in terms of profits. Kaal Sarp Dosh Puja provides financial abundance and security to people in both job and business sectors. Kaal Sarp Dosh Puja creates peace & harmony in the family of a native. Kaal Sarp Dosh Puja also blesses the individual with a happy and blissful marriage. Kaal Sarp Dosh Puja shields the native from all enemies. Kaal Sarp Dosh Puja, on your behalf by highly learned Brahmin Priests to treat the Kaal Sarp Dosh present in your horoscope/kundli and bring forth success & prosperity in your life. Note: The Kaal Sarp Dosh Puja is performed in strict accordance with all Vedic rules & rituals as prescribed in the Holy Scriptures. Why should I go for Kaal Sarp Dosh Puja? Kaal Sarp Dosh is the worst kind of Dosh that a native can possibly be inflicted with. The Kaal Sarp Dosh Puja ends this Dosh and blesses the native with bliss in the areas of health, wealth, marriage and many more. Therefore, one should not miss the opportunity of pacifying Rahu & Ketu and enhancing the luck factor in life by the Kaal Sarp Dosh Puja. Who will perform the Kaal Sarp Dosh Puja? Absolutely, you can watch the Kaal Sarp Dosh Puja being performed in your name via a recording provided to you by us. Is there any minimum age to go for Kaal Sarp Dosh Puja? No. Anyone can go for this Kaal Sarp Dosh Puja. Can I book the Kaal Sarp Dosh Puja for someone else in my family? Absolutely! What better gift can you give to your near and dear ones, than making sure that the root cause of their problems in life is treated once and for all!